Are you looking for high performance speaker that doesn’t take up any floor space or shelf space? The M22 on-wall, Axiom's best high-performance on-wall speaker will blow you away with sound so detailed you'll listen to every CD you own all over again. The M22 on-wall speaker preserves the sonic midrange and treble clarity of its bookshelf equivalent, the M22. The M22 on-wall is a perfect complement to today's modern low-profile plasma and LCD TV screens. Mated with a subwoofer for deep bass support, the on-wall M22 is ideal for average-size (2,200 cu. Ft) to fairly large rooms (3,000 cu. Ft.). Among its innovations, each M22 on-wall speaker includes a dedicated wall-mounting bracket that serves as the electrical connection to the speaker wire. This lets the M22 on-Wall speaker rear baffle mount truly flush with the wall surface for a smooth, self-effacing appearance. All brackets, mounting templates and screws are included. You'll spend hours rediscovering favorite CDs, hearing subtle details other speakers muffle. The M22 on-wall’s deliver a soundstage of unprecedented depth and width, transporting you into the performance. This isn't your average on-wall speaker: the M22 on-wall's unusual dual-woofer configuration mates with a 1-inch titanium tweeter to deliver all the power handling you need for demanding music and movies - up to 200 watts per channel! The M22 on-wall is ideal for an average-sized room (2,200 cu. ft.) or slightly larger one. Its unique tall, slender profile is an elegant addition to any decor, blending beautifully into even the smallest room. These eye-catching speakers are 8 ohms and therefore easy to power with any amplifier, whether solid-state or tube. The asymmetrical anti-standing-wave tapered shape of the cabinet is highly resistant to resonances that can color other speakers' sound. 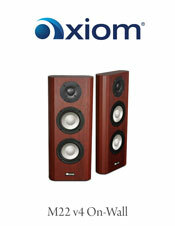 You don't have to take our word for it - audition these speakers in your own home. The M22 on-walls come with a 30-day in-home trial, a five-year warranty and free shipping. Best for medium to large-sized rooms. Very natural spatial imaging. Excellent detail in the negative space. Excellent value. I am surprised how good 'on wall' speakers sound. Don't worry about the return policy I am keeping them! I couldn't be happier with my speakers: VP150 and wall mounted M22s and M2s. The center in particular has changed my movie and TV watching experience. The VP150 delivers dialog with amazing clarity and does so across a very wide area. The M22s are great for movies and I love them for music. I'm also very impressed with how well the M22s and M2s look when mounted. So far I have been very happy with the VP180 center, QS8 sides, and M22 rear speakers. They compare very favorably with the Legacy audio speakers they are replacing, at a lower cost. Looking forward to purchasing the new M100 for my left and right. Love your speakers. Best speaker for the money!! The M22 on-walls serve as the front channel speakers in my 7.1 setup. These look sleek, sophisticated, and unobtrusive if mounted property, yet provide excellent sound, and probably the best sound I’ve ever heard from a thinner profile wall-mounted speaker. Despite my home theatre room being fairly large, these speakers easily fill the room and produce excellent sound; accurate and clean, yet can easily handle any demanding action sequence. Whether it be a whisper or an explosion, they’re real performers! For average sized living rooms, the EP350 provides exciting home theater effects as well as serious bass extension for classical or pop music. Expect thundering rock, explosive movie special effects, or the deepest musical foundations of classical and pop music to be revealed with the Epicenter EP500.